What's the best cinnamon supplement to help control blood sugar? Which cinnamon spice is safest? To help you find what's best, ConsumerLab.com tested popular products, finding enormous differences in the amounts of potentially helpful and harmful compounds in products -- differences labels don't reveal. Cinnamon contains compounds, called proanthocyanidins (PACs), which may be helpful for lowering blood sugar in people with type 2 diabetes and prediabetes. They also contain a potentially toxic and cancer-causing compound, coumarin. However, most supplements do not list the amount of PACs on the label and you won't find coumarin amounts on supplements or spices so you normally have no way of knowing how much you are getting! ConsumerLab.com tests found over 100 mg of potentially beneficial PACs in some supplements, while others had to less than 1 mg in a daily serving. It's questionable whether those with smaller amounts would be effective. Some extracts actually had much lower concentrations of PACs than plain ground cinnamon bark. We found you can pay as little as 22 cents, or as much as $134 for the same amount of PACs! Regarding coumarin, a few products had relatively little while other had amounts of concern. A single teaspoonful of cinnamon from two of the spices contained amounts above the tolerable daily intake level for adults — and way over that for children if consumed on a regular basis. You must join to get the full test results for cinnamon supplements and spices along with ConsumerLab.com's recommendations and quality ratings. You will get results for nine supplements and three spices selected by ConsumerLab.com and for two other supplements that passed voluntary, quality certification testing. Amounts of potentially beneficial PACs found in cinnamon supplements — information you won't find on most labels! 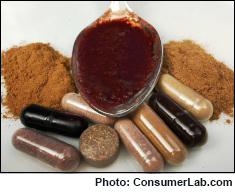 Make sure the cinnamon supplement or spice you use passed our review and is right for you!